One year ago today, China made to clean up its image — with public health advocates, if not with human rights advocates — by executing* its former Food and Drugs minister for economic crimes. Zheng Xiaoyu, China’s drug regulation capo from 1994 to 2005 and only (“only”?) 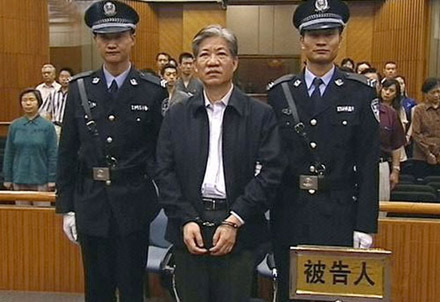 the fourth minister-level official to be put to death in China since the immediate aftermath of Mao Zedong’s reign, was sentenced for extracting bribes from pharmaceutical companies he nominally regulated in exchange for approving their worthless and/or unsafe products. One bogus antibiotic he rubber-stamped killed ten in China before it was pulled from the market, but it was dangerous Chinese products exported abroad — including lethal pet food ingredients to the United States and a cough syrup that killed dozens in Panama — that lit a fire under the export-driven colossus. The court that rejected his appeal explicitly referenced Zheng’s danger to China’s international reputation — simultaneously shifting focus from structural weaknesses by individualizing them to Zheng’s personal failings. On this same day it announced Zheng’s death, China anxiously unveiled plans to safeguard the food supply for its upcoming turn under the Olympic klieg lights. That acid test is now upon it: opening ceremonies are mere weeks away as of this writing. It may have been a politically-driven execution and an unusually heavy sentence, but Zheng’s passing was exulted in China. Someone even tried to put his name on a rat poison — rejected for that most distinguished reason of modern capitalism, Zheng’s own intellectual property in his name. For an interesting dive into the social and legal currents surrounding this case, check out this .pdf edition of Criminal Bar Quarterly. * The method of execution was not announced, and to my knowledge has not been conclusively documented. Gunshot was the longtime standby for Chinese executions, but China has shifted heavily towards lethal injection in recent years; it’s generally assumed that Zheng suffered the latter fate.